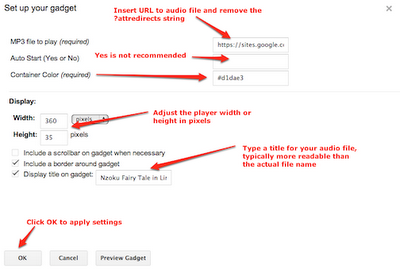 Google does not provide a direct way to insert or embed audio into Google Sites as it does with video. Playing audio requires uploading the sound file and the use of one or two gadgets depending on your audience and the length of your audio recording. Audio can be uploaded to an external web site or uploaded as an attachment to your Google Sites page. Next an audio player gadget is inserted, which links to the audio file's URL. The following techniques are especially useful for developers of personal e-portfolios to add evidence of their learning through audio recordings. Disadvantage: Flash player that will not work on most mobile devices such as an iPad or iPhone. Create or go to the web page where you will insert the audio. At the bottom of the page click Add files and browse for the audio file. Click Open to attach the file. It may take a few moments to upload depending on the file's size. Refer to the figure below. Control-click (Mac) or Right-click (Windows) on the download arrow icon and choose Copy Link Address. This address will be copied to the Google Audio Player. Click Public in the left sidebar. In the Search box type in quotes "Google Audio Player". Click the Search icon to bring up the player(s). Click once to select the Use Google Audio Player to play .mp3 file. Next click the BLUE Select button to bring up the gadget settings. Click in the mp3 files to play box and remove the entire URL. Click in this now empty box. Right-click (Windows) or Control-click (Mac) and choose Paste. This will paste the address that you copied from your audio attachment. Backspace out the ?attredirects string of text up to the audio file suffix (e.g. mp3). See below for an example. The part to erase is crossed out. Apply settings as described on the figure below. Click the OK button to apply the settings. To play examples click the link below. 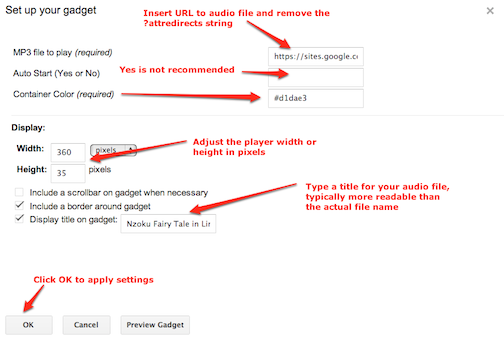 Examples of audio inserted into Google Sites. Advantage: Loads quickly and plays on mobile devices. Disadvantage: Larger audio files load slowly on web pages (up to 1 or 3 minutes) using Google Chrome and Firefox. Refer to the figure below. Control-click (Mac) or Right-click (Windows) on the download arrow icon and choose Copy Link Address. This address will be copied to the Embed Music player. In the Search box type in quotes "Embed Music". Click the OK button to apply the settings. Click the link below to play example recordings. The gadgets you mentioned do not appear. Any suggestions? Make sure to choose Public in the left sidebar, put the gadget name in quotes (e.g. "Google Audio Player"), and click the Search icon. You may have to do this twice. For some reason coming up with gadget not found on the first search. Much appreciated. Everything worked great! When I followed your instructions, I successfully embedded the song (I think) but instead of getting a play button I got a question mark. I then went to your site with the examples and had the same problem. Does this mean my browser won't play the embedded music properly? Thank you very much for posting such a detailed instruction. Both methods work wonderfully! Is anyway to adjust the font/size of the title?